Bryn Greenwood is a fourth-generation Kansan, one of seven sisters, and the daughter of a mostly reformed drug dealer. 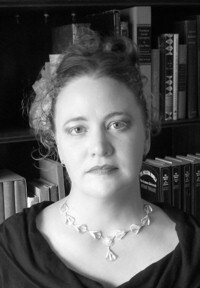 She earned a MA in Creative Writing from Kansas State University and continues to work in academia as an administrator. She is the author of the novels All the Ugly and Wonderful Things, Last Will, and Lie Lay Lain. She lives in Lawrence, Kansas. Some people left Kansas because of the wind. It blew away the soil and the soil blotted out the sun. Death and misery became more readily available than bread and water. My people stayed. I don't know if that makes them stupid, or fatalistic, or just stubborn. We didn't leave, even when it was the smart thing to do. We're certainly not going to leave now. When I was younger, I wandered around the world, but came back to Kansas to write. It was the wind after all. It carried dust into the house all during my childhood and turned my hair into a rat's nest. When I got too far away from it, though, I felt unsteadied. As though I'd been out walking in the wind and it suddenly stopped. As though I were going to fall down without something to oppose me. There are people, so I'm told, who create elaborate outlines and spreadsheets to aid them in the writing of novels. I have not been blessed with this gift. A true story about Lie Lay Lain: it started life as four separate stories. I was fifty thousand words and three years in, before I realized that those four stories were all part of the same novel. The next fifty thousand words were much easier after I understood where the book was going, but if I imagined I'd learn something from that process, I was wrong. When I started writing All the Ugly and Wonderful Things, I had no idea how any of the characters fit together. I went along gamely for many thousand words, before I stumbled upon the intersection of Wavy and Kellen's lives. After that, I was able to see where the other characters fit in, too. Of course, after that, I also knew that I could delete the first thirty thousand words I'd written while stumbling around in ignorance. I am not, by any stretch of the imagination, an efficient writer.